When It comes to rolling paper selection in Kansas City, Lets Vape & Smoke Shop is second to none. We offer all the top brands, styles, and sizes including traditional builds and cones. 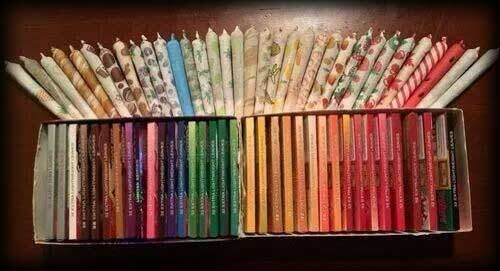 We offer specialty papers such as 100% hemp and also fruity flavored papers. Some Of Our most popular brands include RAW, Zig Zag, Whiz Khalifa, Snoop Dogg, & JOB, & Toke Token. Shine Rolling Papers invented the 24k gold rolling papers for a gold joint, pure leaf tobacco wraps for blunts like backwoods, pre rolled cones for easy to roll your own premium tobacco. Like to polish your roll-up with a tip or filter? We carry a variety of the best Tip & Filter Brands So You Can Keep It Classy. Lets Vape & Smoke Shop also offers a wide large variety of swisher sweet, good times, dutchmaster, & backwoods cigar wraps for your. We also carry a variety of machine rollers and blunt machine rollers that conveniently promote a quick and perfect roll up. We sell individual rollers as well as complete rolling kits that include a roller, herb grinder, and a machine out of the box. Check out our Facebook & Instagram for latest updates & offers.